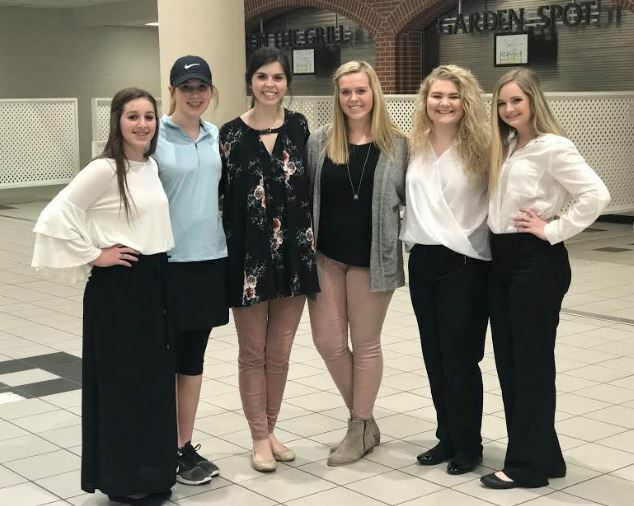 Four members of Fannin County High School’s Family Career and Community Leaders of America (FCCLA) chapter competed at Region STAR Events Competitions on Saturday, Feb. 10. Chloe Clemmons (11th grade) and Bobbi Pippin (10th grade) earned a gold medal in their Sports Nutrition Senior Event where they created and implemented a nutrition, hydration, and exercise plan for an FCHS basketball player. Sierra Reynolds (9th grade), competed in Sports Nutrition Junior and earned a silver medal for the implementation of her nutrition plan for a local ballerina. Cady Finley (9th grade) also earned a silver medal for her Interpersonal Communications Event where she promoted healthy communication and relationships among female teens. Sierra and Cady both scored in the top two of their events and will be advancing to State STAR Events Competitions on March 10, 2018. Pictured above are, from left, Sierra Reynolds, Cady Finley, FCCLA adviser, Lauren Owenby, FCHS FCCLA president, Hope Parris, Chloe Clemmons, and Bobbi Pippin.